Our beloved German Shepherd "Dizzy"
Here are some pics our our beloved "Dizzy". 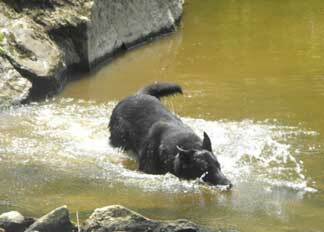 She is a 6 yr old European GSD. She was a wedding present to me from my husband, who was not a dog person to speak of when I married him, but after having her, she has opened his heart to all kinds of dog "stuff"! She is our daughter!, we dont know what we would do without her, and her entertaining ways! Some of these pics are at home, and some are on a trip we took to PA.
She is an excellent credit to her breed, intelligent, friendly, obedient, and discerning, with a silly, comical side to her! We are definatly GSD fans always! Levi, Givan, and Jaden B. 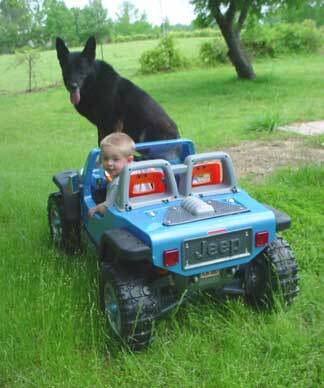 What cute pictures you've given us here - I especially like the one of the baby in the truck - it's almost as if you GSD is telling him, "Hey slow it down a bit there fella - all right!" Dizzy is absolutely gorgeous too - good luck with her in the future.